Following two years of planning and construction, Greater Lynchburg Transit Company is operating out of a new facility on Bradley Drive. The former building on Kemper Street is estimated to be nearly 100 years old and used to house the Lynchburg trolley cars dating back to the early 1900s. 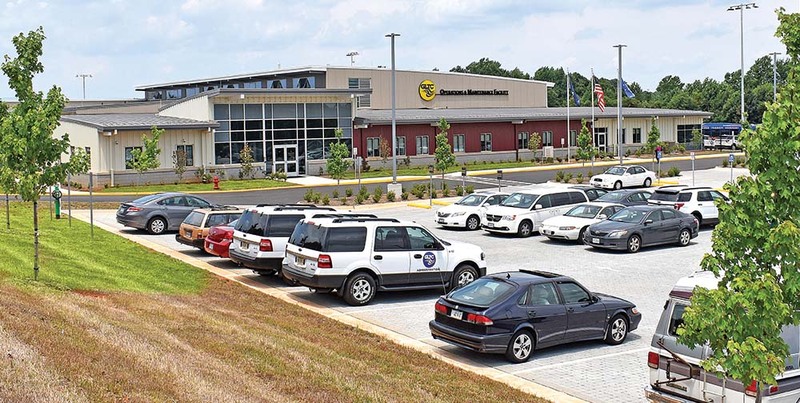 The Bradley Drive building is 50,000 square feet and has eight bus maintenance bays, a wash bay and fully secured parking for the entire fleet. The $23 million project was funded through a combination of state, federal and city funds. The City of Lynchburg is now accepting bids on a construction project that will extend the James River Heritage Trail. A $300,000 grant from the Commonwealth Transportation Board will be used to extend the trail from the Ed Page entrance across the Langhorne Road Trestle to Linkhorne Middle School. The extension includes 2,200 linear feet of asphalt trail. “This is a keystone project for the future of Lynchburg’s premier trail system and will eventually provide access to destinations such as Peaks View Park, Ivy Creek Park, Poplar Forest and the D-Day Memorial,” said Park Services Manager Andrew Reeder. In a continuing effort to combat poverty, city officials will use a $117,000 grant to focus on the area’s unemployed population. The funds from the Commonwealth of Virginia’s Community Wealth Building for Temporary Aid to Needy Families (TANF) will help those with multiple barriers in becoming employed to prepare to enter and maintain employment with the prospect of a career path and wage growth. A few of the most common barriers are education, child care, transportation and workforce development. The city’s request for the block grant included funding for a part-time program administrator and a full-time navigator who will act on behalf of clients and businesses and work with the city to track participant progress and report program metrics. The primary focus will be enhancement of the city’s ongoing TechHire and Bridges Out of Poverty “Getting Ahead” initiatives. Ladle & Blade, a marketplace for commercial-grade kitchen tools, is now open in downtown Amherst. Amherst resident Carl Jackson launched LadleAndBlade.com in 2016 as an offshoot of Unitec Sales Associates, a supplier of commercial kitchenware and supplies that primarily serves state agencies, hospitals and schools. Jackson recognized a growing interest in commercial-grade yet affordable kitchen products among individual consumers and smaller organizations. The new showroom, located at 106 East Court St., is the first brick-and-mortar location for the retailer. The SOVA Innovation Center, Bedford County’s newest engineering and research initiative, has launched in the New London Center for Business and Technology. Mid-Atlantic Broadband Communities and Adaptrum have partnered together to launch the new center to house the innovative TV White Space wireless technology. The new technology will help make broadband affordable and available to residents in rural southern Virginia as well as to other unserved communities across the U.S. and internationally. Building on the success of the Homework Network TV White Space pilot program, the largest initiative of its kind in North America, the SOVA Innovation Center will be instrumental in expanding the program from 100 households to 1,000 households by the end of the year. Positive Ranking for Bank of the James Financial Group, Inc.
Based on a ranking released by American Banker, Bank of the James Financial Group, Inc., parent holding company for Bank of the James, is among the top 200 community bank holding companies, banks and thrifts in the nation. The ranking was based on a three-year average Return on Equity for 2014-2016 for publicly traded and SEC-reporting companies that had less than $2 billion in total assets on December 31, 2016 and met certain criteria relating to capitalization. According to American Banker, Bank of the James Financial Group Inc.’s three-year average Return on Equity was 8.89 percent compared to the median for all 669 qualifying institutions of 7.62 percent. BWX Technologies, Inc. says its Four Rivers Nuclear Partnership, LLC joint venture with lead partner CH2M and Fluor Corporation was awarded a contract at a U.S. Department of Energy plant in Kentucky. The contract is valued at approximately $1.5 billion over 10 years. The scope of the contract focuses on the continued deactivation of the facilities and preparing the facilities for future demolition, while maintaining compliant waste management and environmental remediation operations. The goal of the deactivation and remediation activities is to reduce risk and accelerate the reduction of future surveillance, maintenance and demolition costs. Hear from BWXT CEO Rex Geveden in our Leader Profile section on page 18. 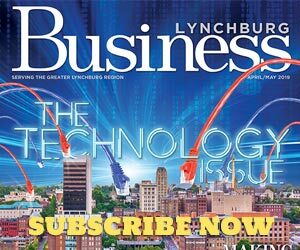 According to leaders at the Lynchburg Regional Business Alliance, construction on their new facility in the former James River Conference Center should be complete before the end of third quarter. Renovations to the building began in March. The 24,000-square-foot facility will give the Alliance much more office and meeting space than their current building on Memorial Avenue. The project cost $1.35 million. Opening in June on Grove Street in Bedford, Beale’s Brewery and BBQ is expected to add 30 jobs and $2.5 million in economic impact to the area. In 2015, Waukeshaw Development, the team behind Beale’s, approached county and town officials about their idea for a brewery. The project was made possible through a combination of state and federal historic tax credits, along with a $600,000 grant from the Virginia Department of Community and Housing Development’s Industrial Revitalization Fund. Bedford native James Frazer is the brewmaster. The U.S. Chamber of Commerce awarded the Bedford Area Chamber of Commerce with 4-Star Accredited status for its sound policies, effective organizational procedures and positive impact on the community. “Accreditation validates a chamber as having programs that benefit their local economy and for positively influencing action in their community,” said Raymond P. Towle, IOM, CAE, Vice President, Federation Relations and Institute for Organization Management. Accreditation is the only national program that recognizes chambers for their effective organizational procedures and community involvement. In order to receive accreditation, a chamber must meet minimum standards in their operations and programs, including areas of governance, government affairs and technology. For the first time in the history of Rotary Club of Lynchburg Morning, two people under the age of 30 will be leading the organization. The 2017-2018 President is Aaron Van Allen, Director of Alumni Relations at Hampden-Sydney College; President-Elect is LaShonda Delivuk, Chief Marketing Officer of About 90 Marketing. This year, the club celebrates its 30th anniversary. Lynchburg resident Isabelle Duston will find out in September if she makes it to the next round of the XPRIZE competition. Duston, originally from France, is the CEO and founder of consulting firm Education Technology for Development, which assists NGOs and government agencies that want to use technology to evaluate their education programs, improve the delivery of their education resources or create online training courses. Duston’s team, Education Apps for All, is one of 11 semi-finalists in the competition for her development of a global educational app MoToLi (Mother Tongue Literacy). The app helps students to learn, practice and read with a phonic pedagogy in local languages and provides educational opportunities for the world’s most financially disadvantaged people. If her team is selected as one of the five finalist teams, their solutions will be deployed across 100 villages in a developing country, reaching 3,000 children (ages 7-12) over the course of an 18-month period.